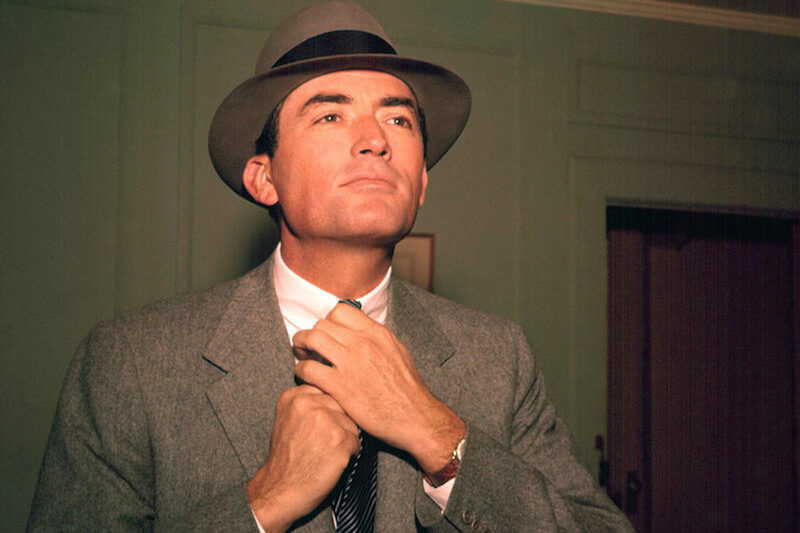 Forget the supercilious connotations of The Man in the Gray Flannel Suit’s title: Gregory Peck’s two-piece in the eponymous movie was, and remains, worthy of the sartorial übermensch. Gregory Peck in The Man in the Gray Flannel Suit, 1956. For those of a rakish disposition, it’s chillingly ironic that the soft-woven two-piece referred to in the title of The Man In The Gray Flannel Suit, the 1955 novel by Sloan Wilson on which the 1956 movie adaptation starring Gregory Peck is based, represents the stale hypocrisy of the upstate-dwelling, Madison Avenue-commuting dullard: an emblem of those whose ambitions go no further than sustaining a quotidian suburban living through vacuous corporate endeavours. The life of Tom Rath, viewers of the film quickly find out, was once vastly more colourful. The regular flash-back ruminations on his earlier life as a World War II army officer reveal deeds both heroic and less so (including the accidental killing of his best friend), as well as a torrid romance with Italian girl Marisa Pavan. So it’s perhaps apt that the elegantly draped suits Peck wears in the movie (not all of them grey, incidentally) reflect a man of depth and intrigue. The movie character’s clothes have a distinctly Martini-dabbed touch of Mad Men about them, an effect enhanced by the fact that they’re caressing the distinctive form of Peck: a tailoring aficionado who ordered 160 suits from Huntsman over the course of his London visits, and whose frock coat from The Million Pound Note remains on display at Number 11 Savile Row. One has to suspect, in fact, that the gentle-mannered Californian – if his guises in Roman Holiday and To Kill A Mockingbird are anything to go by – would have checked the costume policy in advance, and offered the casting directors a hollow laugh if they had posited that his garb in the movie should reflect the conservatism and abject conformity it does in Wilson’s novel. And hence, more than six decades after The Man in the Gray Flannel Suit’s release, nailing Peck’s look is no disentombing of some antiquated guise: his character would look far more in situ sauntering the chicest hotspots of contemporary Rome and London than the crannies and corridors of Manhattan’s more humdrum corporate environs. And, a great deal of the sartorial punch packed here comes courtesy of the very fabric – arguably the most underrated outside of sartorially savvy circles – afforded such unreasonably drab connotations by the movie’s title. Flannel, for those late to the party, is a soft twilled fabric (wool, in sane circles) with a loose texture and a napped surface, often treated in milling machines in which the cloth is beaten about and the fibres broken, producing that fuzzy effect which is at once pore-caressingly tactile and highly pleasing to the eye (especially if one spends a large portion of one’s waking hours in the kind of environment where worsted fabrics – those woven from combed, lengthy yarns which have a glossy, smooth finish – are de rigueur). While a hit amongst style mavens, flannel remains a woefully under-discovered fabric in wider society, judging by the hordes of weekend metropolitan revellers in the UK who match shiny worsted suit jackets with denim or chinos, seemingly unaware of how jarringly the two often juxtapose. Flannel, a far more reliable hit with casual trousers, also works stunningly well with certain suiting usually associated with stiffer environs. A double-breasted, low-buttoned, peak-lapelled jacket in a chalk-stripe flannel fabric from Vitale Barberis Canonico, for example, is pretty much the epitome of The Rake’s tagline ‘The modern voice of classic elegance’, as is this single-breasted, three-roll-two jacket with front flap pockets and double vents, a collaboration between Vitale Barberis Canonico and Orazio Luciano, and part of The Rake’s Flâneur Collection. A navy or brown houndstooth flannel jacket from Rubinacci, meanwhile, demonstrates how conducive the cloth is to that house’s famously soft construction. Yet flannel’s merits are not confined to the world of suiting, as hinted at by the fact that many people wrongly assume the word ‘flannel’ to be synonymous with ‘checked’ or ‘plaid’ when it comes to shirts. In fact, shirts by Santillo (notably their beige or grey Gaglioppo piece) and Chester Barrie (see theirs in dark blue chevron) serve as an all-day reminder of flannel’s tactile properties via the wearer’s torso, while plenty of loafers, hats, ties and pocket squares out there also testify to this extraordinary fabric’s versatility. Much like those generously draped, notch-lapelled two-pieces still do, especially when complemented by a brimmed hat and tie pin, 60 years after one of the best-dressed men in the movies teased a white silk square into his breast pocket and told the cameras to start rolling.